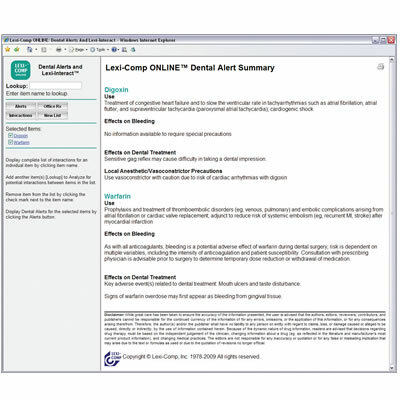 Lexi-Comp ONLINE for Dentistry | Lexi-Comp, Inc.
Lexi-Comp ONLINE for Dentistry provides convenient, immediate access to time-sensitive, dentistry-specific pharmacology and clinical reference information. Lexi-Comp's ONLINE for Dentistry is an Internet-based resource designed to improve patient care and increase efficiency. Annual subscribers have access to all of Lexi-Comp's dentistry- specific knowledge areas, including drugs and natural therapeutics, oral diseases, implants, endodontics, clinical periodontics, oral surgery for the general dentist, treatment of medically compromised patients, in-office medical emergencies, and finances. Drug-related content includes up to 55 fields of information for more than 1600 drugs, as well as customizable office formularies, drug monographs, and drug identification. With Lexi-Interact, users can access all interactions and instant dental alerts for a selected medication/natural product or treatment regimen. Lexi-Comp also includes Web search capabilities, detailed clinical art, and printable patient-education materials in 18 languages. Eleven dentists participated in this Dental Product Shopper evaluation of Lexi-Comp ONLINE, rating such features as improved patient safety, dental-specific pharmacology content, and up-to-date information. Drug-interaction analysis, called 'indispensable' and 'the most important area,' was rated as excellent by 8 evaluators and as very good by 3. Overall satisfaction was rated as excellent by 8 evaluators and as very good by 3. Nine evaluators said they would definitely subscribe to Lexi- Comp ONLINE, 2 said they probably would, and all 11 said they would definitely recommend it to colleagues.